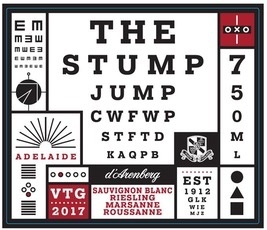 Wine d’Arenberg The Stump Jump White Blend McLaren Vale 2017 - Royal Wine Merchants - Happy to Offer! A crisp, refreshing white blend, with a touch of sweetness. Sauvignon Blanc contributes to the lifted, tropical fruit nose, whilst Riesling is more apparent on the palate with mouth-watering lemon, lime and green apple flavors. Aromatic, fun and easy drinking, this wine is great with food or without. The name ‘Stump Jump’ relates to the significant South Australian invention – the Stump Jump plough. This plough became a popular piece of machinery for ploughing fields because of its ability to ride over stumps and gnarled “mallee” Eucalypt roots and snags, saving valuable time and resources by not stopping the draught horse.